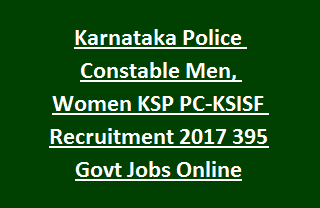 candidates can submit their application form for this SISF PC Constable Jobs of Karnataka through online on or before 25-June-2018 through the official website of KSP Online. This police constable vacancy only for the Both Male and Female candidates. Selection for these PC KSISF Constable vacancies will be held through Endurance Test, Physical Efficiency Test, Physical Standards Test and written test. For more details refer the below given information for Karnataka PC-KSISF Constable Vacancies. There are total 395 vacancies available in this Karnataka PC KSISF Recruitment. For SC, ST, CAT-01, 2A, 2B, 3A & 3B 18-27 Years. For ST Tribal candidates 18-30 Years. For GM, 2a, 2b, 3a, 3b candidates Rs.250/- and for all other Rs.100/-. Candidates have to pay this amount in State Bank of Mysore or State Bank of Hyderabad through online generated chalan at the time of form submission. For Direct candidate 2 km running to be completed in 10 minutes. For Ex Serviceman and women candidates 400 mtrs running to be completed in 04 minutes. Candidates can submit the application form online @ KSP SISF Online official website @ http://sisfpc18.ksp-online.in/. Submit all the information and upload the photo and signature. Generate the chalan form online and pay the fee @ SBM or SBH and update the payment details on or before 28-06-2018.